While many of the spreadsheets that you work on in Google Sheets may only contain one worksheet, there are a number of situations where you may find yourself working on a file that has a lot of different tabs in it. This could be something like a weekly or monthly report where each tab indicates a particular time frame, and keeping all of those worksheets in one workbook simply makes it easier to organize, edit, and analyze your data. But individually printing each of those tabs can be tedious, particularly if there’s a lot of them, and you need to perform this printing task on a regular basis. 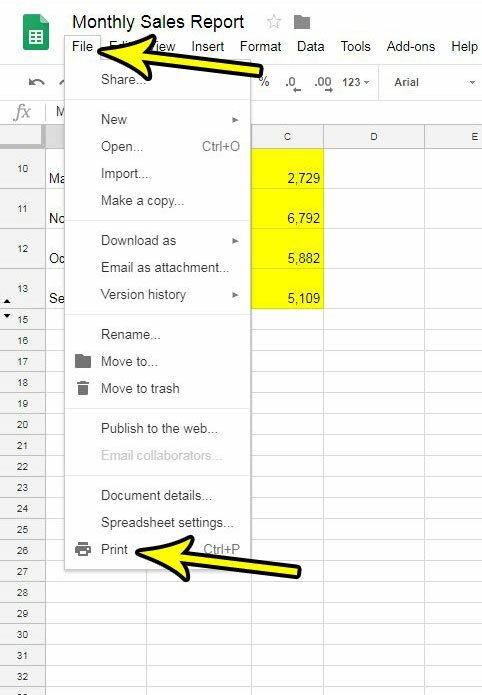 Fortunately Google Sheets makes it possible for you to print the entire workbook at once, which will reduce the amount of steps needed to print all of the tabs in your Google Sheets file. The steps in this article were performed in the desktop version of the Google Chrome Web browser, but will work in other desktop browsers like Firefox and Safari, too. 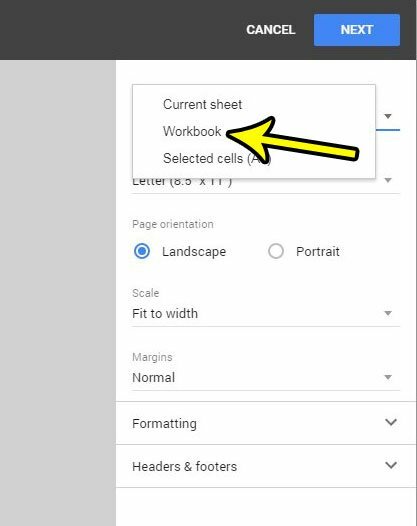 Step 1: Sign into your Google Drive and open the Google Sheets file for which you would like to print the entire workbook. Step 2: Select the File tab at the top of the window, then choose the Print option at the bottom of this menu. Step 3: Click the dropdown menu under Print at the top of the column on the right side of the window. Step 4: Select the Worksheet option from the dropdown menu. 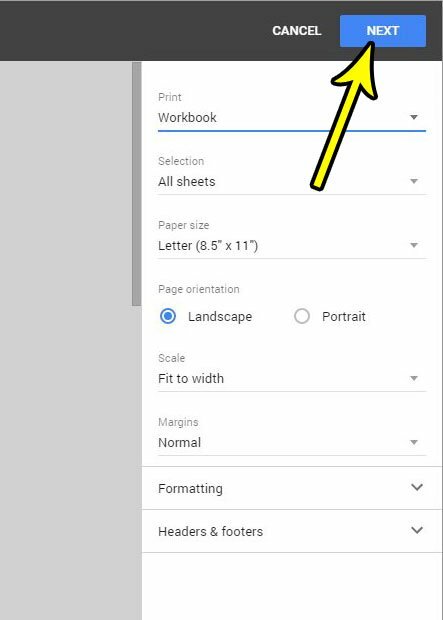 Step 5: Scroll down to confirm that each worksheet looks the way that you want it to, then click the blue Next button at the top-right of the window. 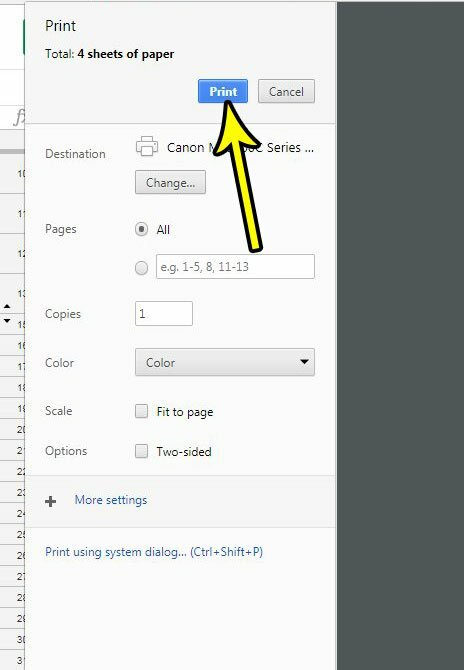 Step 6: Adjust any of the settings on this menu that you need to, then click the Print button to print all of the tabs of your workbook. 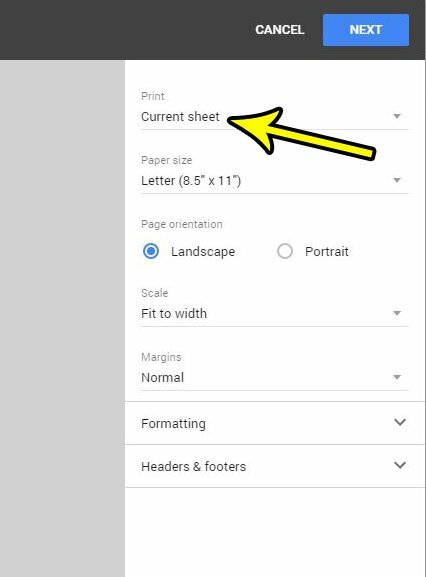 Google Sheets has a number of different formatting options that can make your printed spreadsheets look better. Find out how to print with gridlines in Google Sheets if you find that your data is difficult to read because it isn’t visually separated as much as it should be.